He accused the DUP leader Peter Robinson of “dancing to the tune of loyalist extremists”, particularly over his ditching of plans to create a peace centre at the site of the former Long Kesh prison. More generally, he said that unionists and Orangemen were “trying to put a brake on the development of Irishness within the northern Irish state”. Mr McGuinness was commenting after a leading Orangeman urged Protestants not to learn the Irish language because it is “part of the republican agenda”. 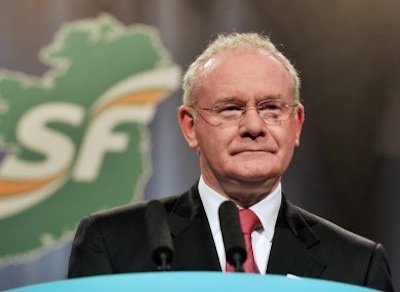 Speaking ahead of Sinn Fein’s Ard Fheis [annual conference], which got underway this Friday evening at the Opera House in Wexford, Mr McGuinness admitted he was “embarrassed” that his Six-County administration is seen to be incapable of making decisions. Six years after Sinn Fein agreed to share power in the Six Counties with the hardline unionist DUP, more than three-quarters of the DUP’s Assembly members still won’t even acknowledge him when they pass him on Stormont’s corridors. “I think the DUP approach it on the basis of sharing power on their own terms,” he admitted. Unionist political leaders had remained silent about loyalist riots, shootings, sectarian provocations and the creeping paramilitarism of the Orange Order. The Orange Order, which organises anti-Catholic parades in the north of Ireland, was now allied to the paramilitary UVF, he said. They had been “handed a veto” by the DUP over the outcome of recent negotiations mediated by US envoy Richard Haass. While admitting Sinn Fein’s political efforts in the Six Counties had been struggling, he welcomed appeals by well-known republican figures for the breakaway IRA groups to rethink their strategy. Speaking to loyalist and British newspapers recently, former political prisoner Gerard Hodgins, Dominic McGlinchey, a son of the eponymous INLA leader, and researcher Anthony McIntyre, separately urged those republicans opposed to Sinn Fein to “review” their strategy.